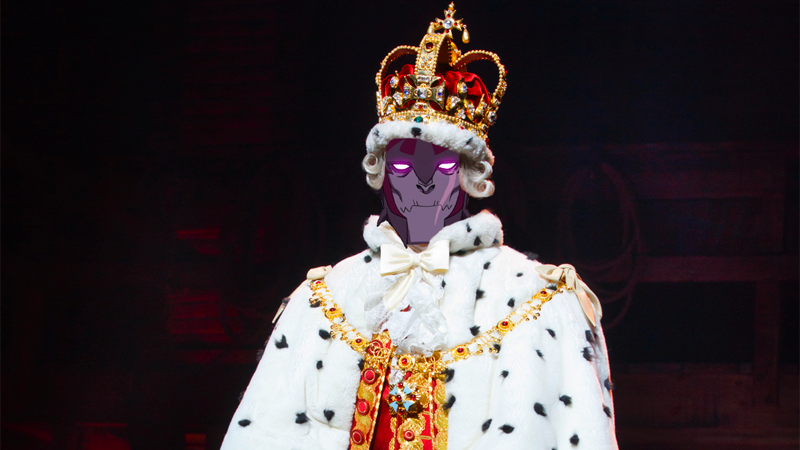 Emperor Zarkon as King George. The voice actors of Netflix’s Voltron: Legendary Defender are a notoriously musical bunch who, when presented with the opportunity, will gladly get together to sing numbers capable of sending multiple fandoms into a massive tizzy. We’ve heard the Paladins’ dulcet tones, and now it’s Emperor Zarkon’s turn. And he’s taking on Broadway’s Hamilton. Recently, Neil Kaplan (the voice of Emperor Zarkon) took to his Twitter account to ping Hamilton creator Lin-Manuel Miranda about a little something he’d whipped up for a friend—specifically, a cover of “You’ll Be Back,” a song performed by Hamilton’s King George III. While Kaplan’s upload doesn’t have any visual accompaniment to it, there’s something utterly delightful about hearing Zarkon’s voice crooning about the perils of breaking away from an oppressive empire. In Hamilton, the song is George’s attempt at convincing American rebels that the difficulties of independently running a country are infinitely worse than living under British rule. Freedom, George posits, comes at a cost that has to be paid down the line once leaders get into the nitty-gritty, everyday realities of statecraft. Kaplan’s performance cleverly nods to how, in Voltron’s seventh season, the Paladins’ triumph over Zarkon and the Galra empire leads to an entirely new set of conflicts as the galaxy’s various planets adjust to the new status quo and power dynamics of the world. The Voltron fandom has been clamoring for a musical for ages, and with the show heading into its final season, right around now’s about the time that such an episode would be perfect to record. Perhaps with a little help from Miranda himself?